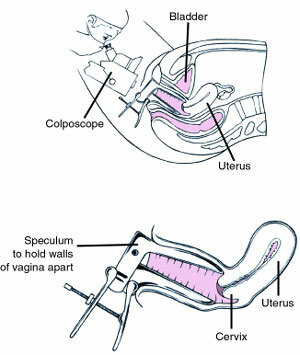 A Colposcopy is a procedure that allows your doctor to look at your cervix with a microscope. It is usually recommended when a cervical smear or Pap test suggests that there are precancerous changes on the cervix. Colposcopy is a painless procedure performed in outpatients. A speculum is passed (just like having a smear). The woman usually has her legs in stirrups to allow access for the doctor and microscope. A weak solution of acetic acid (the same acid found in vinegar) and iodine is painted onto the cervix. Cells that are precancerous become white, as they absorb more acid. A tiny biopsy (a small piece of the cervix) of the affected cells can be sent to the laboratory where they can be tested. The doctor will be able to decide the next step when the biopsy results are known. There may be a small amount of bleeding following the procedure. Normal activities can be resumed immediately after a biopsy.